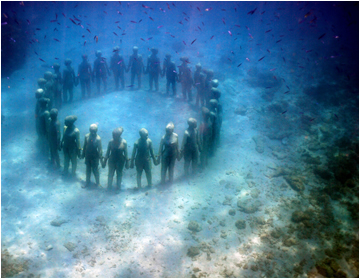 If ever in Cancun or Isla Mujeres, check out the underwater sculptures of Jason deCaires Taylor. 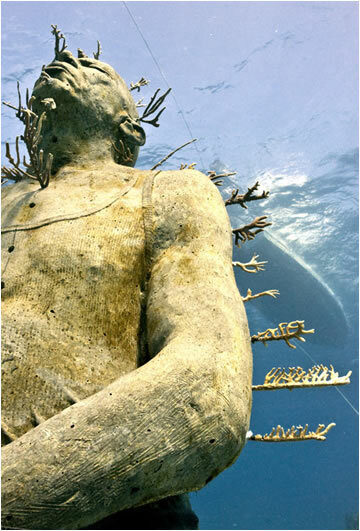 This artist has created works of art that have become artificial reefs, attracting marine life, while providing the viewer constantly changing views due to the sunlight and shifting sand of the ocean floor. When the project is complete, it will consist of over 400 life-size sculptures. This will be one of the largest underwater artificial attractions in the world, and it will draw traffic away from the over-visited natural reefs. The Cancun Marine Park currently has over 750,000 visitors each year, and this new attraction will give the natural reefs a chance to repair and regenerate. To date the underwater museum comprises of 4 installations; La Jardinera de la Esperanza, Coleccionista de los Sueños, Hombre en Llamas and The Silent Evolution. The Silent Evolution, his most ambitious work to date, is a collection of over 400 life-size figurative works forming a timeline of the changes both visually and socially in humans over the past centuries. 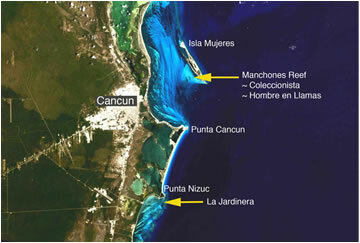 The National Marine Park of Isla Mujeres, Punta Cancun and Punta Nizuc is located in the northern part of the Mexican state of Quintana Roo. The sculptures are located within the boundaries of The National Marine Park on sandy areas of substrate close to Isla Mujeres, Punta Cancun and Punta Nizuc.